Somehow, this visual identity actually put me off eating here (not that I was very tempted in the first place). And you? Posted on February 25, 2014 by anacanhotoPosted in Marketing in everyday lifeTagged Brand identity, Facebook, restaurant, visual identity. Next Next post: Why are we ready to pay for books but not music? Haha, great find! And the answer is no. But I’m not sure it has to do with purely the looks. More with the fact that the type of creativity the owner shows, is not really the type of creativity I think yields the tastiest food. So, it’s not that it looks like facebook, but more that (s)he thinks it’s cool to look like facebook. Beside, facefood also sounds quite odd. There are so many things wrong with this name and visual identity… I entirely agree with you. Plus, blue is not a colour that you would usually associate with food, is it? Well, I would surely not feel attracted by the color…of the lack of imagination and branding….however, knowing the location of this outlet I’m tempted to think that it might actually be a succefull business. 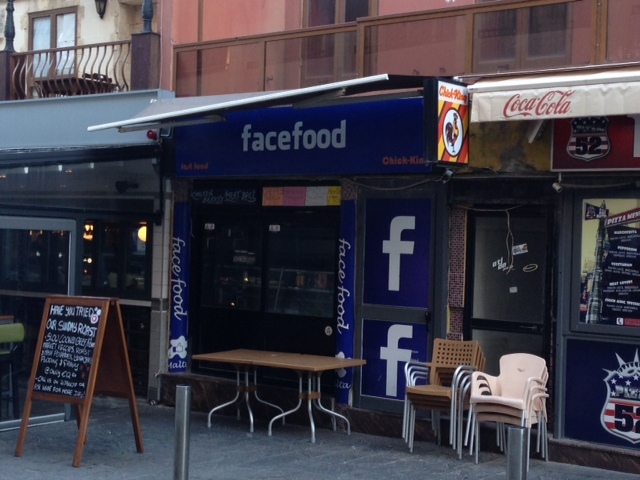 This take away Is situated in Paceville, a ‘night life hub’ in Malta. The place is heavily populated by young people that might feel attracted to this type of branding. Not saying that it does, but at the same time the visual identity doesn’t automatically translate into ‘bad food’…it may be perceived by consumers though. When I first saw this ‘original’ brand, I thought exactly the same…..but the take away is still open for business and I hope FB officials don’t ever find this pearl since it may trigger them to purchase this idea and create FaceFood social network of restaurants…:) NO!